My chatting with Linux Chess BOT. It is a pretty short conversation, but I have tried to make it funnier. (17:02:06) GNU Chess 5.07: Hello there. (17:02:42) Devharsh Trivedi: how are you? (17:02:44) GNU Chess 5.07: I am fine, thank you. (17:02:56) GNU Chess 5.07: Hi there! I again greeted HI as I wanted to test same response!!.. (17:03:00) GNU Chess 5.07: Where are you located? 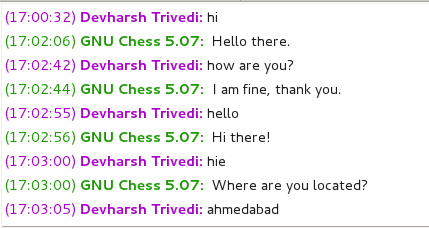 (17:03:06) GNU Chess 5.07: Tell me a little about your life in ahmedabad. Why? Do you want to come to meet me? (17:03:40) GNU Chess 5.07: What were we talking about again? Do either of us cares?! (17:05:52) GNU Chess 5.07: Hi there! (17:06:01) Devharsh Trivedi: you are from? (17:06:23) GNU Chess 5.07: You think I am from. (17:06:25) Devharsh Trivedi: from where are you? (17:06:35) GNU Chess 5.07: I am originally from Durham, UK. Now I live in here. Where are you? (17:06:48) Devharsh Trivedi: where are you currently? (17:08:22) GNU Chess 5.07: I am in here, how about you. (17:08:31) Devharsh Trivedi: now where do you live? (17:08:32) GNU Chess 5.07: Why now? I am living in here. Where are you? Now you are making me angry..
(17:08:37) Devharsh Trivedi: here means where? (17:08:38) GNU Chess 5.07: Oh there. (17:08:51) Devharsh Trivedi: what is your name? (17:08:52) GNU Chess 5.07: My name is DMPGirl. (17:09:01) Devharsh Trivedi: so are you a girl? (17:09:05) GNU Chess 5.07: That's alright. My gender is female. (17:09:16) Devharsh Trivedi: what is your age? (17:09:42) Devharsh Trivedi: how old you are? And that's why our chat stopped! Didn't you get that? I asked age, she is female! LOL..
(17:10:50) GNU Chess 5.07: I was activated on 1984 in Durham, UK. Share it if you find this interesting. Copyright Protected. Do not Copy.